Cleansing Oil was developed for normal & dry skin types. The key ingredient here is apricot kernel oil. According to Joanna, she ‘chose it because it spreads well and feels beautiful, as it is massaged onto the face. But just as importantly, it is a very mild oil, which is tolerated by most people (and I wanted all the products to be suitable for sensitive skin, not just the soothe range), and it has beautiful softening and smoothing qualities. The olive oil contains squalane, which is wonderful for dry skin, absorbs quickly and helps the spreadability of the other oils, as they are massaged onto the face. The castor and jojoba oils are added in, to help the deep cleansing properties of the oil. This is a richer oil than the other cleansing oils, and is the most suited for those with dry skin’. This oil smells of lavender and as soon as you put a few drops of it on your fingertips and inhale it deeply, it calms you down. My own little wellness tip here is to take a few deep breaths, inhaling for five and exhaling for seven and after a few rounds of doing this breathing exercise, you will feel like the worries of the day are taking a backsit to your ‘me-time’. One of the reasons while I like ‘simple’ product formulas, is that they quickly allow you to orientate yourself, as let’s be honest, most of us don’t have degrees in chemistry, nor possess encyclopaedic knowledge of each ingredient and its effect on our skin and wellbeing. They are like a simple, yet delicious home-made meal, which you savour with gusto, as opposed to an elaborate one that you struggle to digest. Joanna spends more hours than she cares to count researching the qualities of all possible ingredients. As a customer, I find it both endearing and reassuring. I also know that for Joanna ‘the joy comes in concocting recipes where the oils complement each other – both nutritionally (getting the right mix of vitamins/omegas, for example) and scientifically, as well as getting the right mix of their “feel”, smell and stability. It is so satisfying when it all works and a mix comes together’. This cleansing oil feels ‘richer’ in texture & ‘slippiness’ factors and would work well for dry skin particularly or for normal when you feel that it needs a little bit more of nurturing, due to external factors, like cold weather outside. Interestingly, it doesn’t feel ‘too’ rich when you apply it to the skin and seems to sink into your skin – it almost feels like a mask when you are in the shower and once you remove it with a wet face cloth, skin feels clean, plump and well hydrated, which is particularly welcome when the cold or dampness seems to sip in your bones. Combining face cleansing with a shower, while having this cleansing oil on your face, helps to open the pores and let’s skin breath, so it looks more radiant even before you apply your night cream or serum or both. Sweet orange and lavender essential oils, containing healing, anti-bacterial and anti-fungal properties. 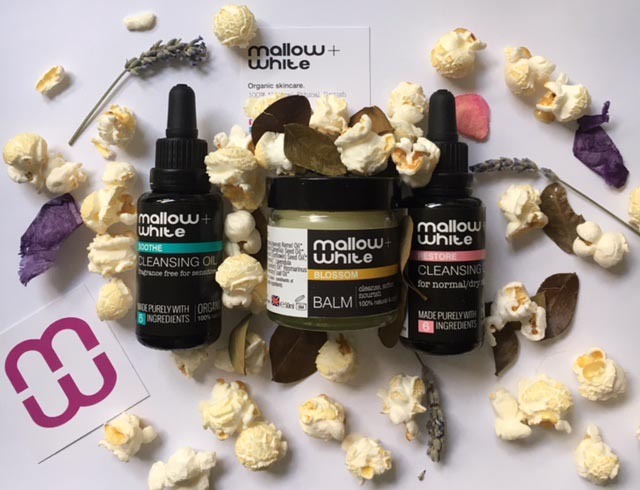 Having used & reviewed Mallow and White products before, I asked Joanna what makes those new additions different to her existing products ( apart from the obvious, that those are the oils for morning or evening skin cleansing ). Joanna’s answer didn’t surprise me, but reinforced a feeling that a deeply thoughtful woman is behind this small, but effective skincare brand: ‘I love the idea that you can, to a certain extent, mix and match the products. For example, you can use the cleansing oils on their own, or add a little of the dry mask into the palm of your hand and mix with the cleansing oil to make an exfoliating cleanser. In the same way, you can add a couple of drops of facial oil into the mixed mask for an added moisturising boost. In this way, they become a little more bespoke, as you can add a little of something else to enhance/deal with whatever your skin needs at the time. Blossom Balm: this balm was created by Joanna in collaboration with a natural beauty blogger, who has a special penchant for honey, Amber Felce, aka Amber’s Beauty Talk, and who was one of the first bloggers that Joanna contacted even before Mallow & White was in existence. Amber was generous with her time and advice, while Joanna was in the process of launching her brand and the two women kept in touch via e-mail since then. At some stage Joanna was wondering whether to launch balms or cleansing oils, so Amber came up with a suggestion of launching the cleansing oils on Mallow & White website and a bee-related balm on Nectar & Bumble, Amber’s online store dedicated to all things…yes, you guessed, buzzy bees. Joanna created multiple recipes and both she and Amber trialled them, until they came up with the formula they now have. The balm has six ingredients and can be used in a variety of ways, for example as a cleansing balm, overnight mask or just dabbed on little patches of dry skin. Personally, Joanna likes the lightness of this balm and the way it leaves her skin feeling after leaving it on overnight. This balm has the loveliest, meltiest quality and you just want to sink your fingers into it and smell it – a jar filled with a sense of care and indulgence. It glides lightly & easily on the skin and leaves it feeling protected by an almost invisible veil. If you fancy using it as a cleanser, just gently massage a small amount of it onto dry skin in circular movements. Leave it on while you brush your teeth and then remove with a warm damp cloth or flannel ( I like using Aurelia‘s bamboo cloth or Skin & Tonic’s muslin ), to reveal smooth, clean skin that has been nurtured, not stripped or aggravated. If you feel like giving your skin a restorative boost, cleanse your skin with it or another cleanser of you choice, pat the skin dry and massage the balm onto your face and neck and leave it overnight to work – you will awake with a soft and restored complexion in the morning. I like doing this on a Saturday evening and on Sunday morning potter around without a scrap of make-up, feeling content in my skin. Another tip of mine is to use it to nourish your cuticles and hands, as well as lips and elbows. This balm celebrates the plants that bees love, as well as beeswax that those lovely insects produce. I wish more skincare products were like that, celebrating and supporting nature and not working against it, as well as your wellbeing. Ingredients: Prunus armeniaca (Apricot) Kernel Oil*, Camellia Oleifera (Camellia) Seed Oil*, Helianthus Annus (Sunflower) Seed Oil*, Cera Alba* (Beeswax), Lavendula Angustifolia (Lavender) Oil*, Rosmarinus Officinalis (Rosemary) Leaf Oil* (Geraniol, Limonene, Linalool – constituents of essential oil) *organic. As I am typing at my desk, I can see a robin and a squirrel that came into the garden lured, no doubt, by the contents of the Mallow & White packaging box, that contains dry lavender, rose petals and popcorn. This is one of the things that makes the brand so endearing to me – a genuine ethos to support you, the customer, as well as the nature. No compromise, just a natural fusion of simple things that nurture not just the skin, but your mind, by offering special moments of dreaming and reflection.